My Baby Trakker offers multiple uses and benefits for both the mother-to-be and her baby. As the mother starts to notice changes developing to her body, she will have many questions. This Baby Book will help her to monitor and track her own health and the health of her baby. When I first found out I was pregnant, I remember I was scared to death, I knew nothing. I wanted to create a baby book to help guide new mothers through their pregnancies and pre-natal care. The early part of development is the groundwork for a healthy pregnancy and the birth of a healthy baby. These early weeks are such a complex process an expectant mother needs every tool available at her fingertips. Introducing Baby Trakker, an extensive personal record keeping system for mothers-to-be. Pre-natal records are essential; Baby Trakker includes a pre-natal introduction, which defines all the tests that will be done during pregnancy followed up with a section to record test dates and results from the beginning of pregnancy all the way through delivery. This personal record keeper can be used to record all the information needed about family medical histories, past pregnancy histories, and provides a pregnancy risk assessment. Many physicians have adopted a scoring system for the purpose of evaluating a mother’s pregnancy risk. This baby book has an assessment that can be taken to a physician to gather information in the first trimester (the most critical time) for determining if there’s a risk for developing complications during pregnancy. Keeping clear concise records will offer a little peace of mind in knowing exactly what blood test and ultrasound test results are and help avoid missed appointments, duplicated tests and misinformation. There’s tons of information throughout Baby Trakker inlcuding explanations about growth development, percentiles, information on SIDS (Sudden Infant Death Syndrome) and preventative tips, breastfeeding and the benefits. “When I first found out I was pregnant, I remember I was scared to death, I knew nothing. I wanted to create a baby book to help guide new mothers through their pregnancies and pre-natal care,” said Author Amber Bowden. This baby book is so essential for not only the expectant mother, but after childbirth as well. There’s so much information to keep track and BabyTrakker has a place for it all such as: a daily management/planner calendar, a section to record post natal visits, well baby visits and checkups all the way through 2 years old, immunization records, injury and surgical records, medications, allergies, keepsake pictures, milestones and accomplishments all the way through age five… the list goes on and on. Finally a baby book that has everything. This is a must have for any home library. 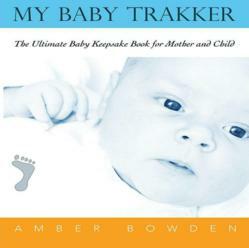 You can find My Baby Trakker online at MedTrakker, Amazon, Barnes and Noble and many other popular book retailers. Author Amber Bowden is available for speaking events, book signings and expert quotes and can be reached at Linkedin and at Twitter to answer further questions regarding the whole family of MedTrakker Personal Medical Record Organizers.